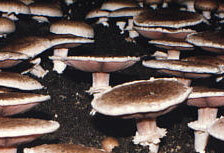 GROW YOUR OWN PORTABELLO MUSHROOMS. NZ only. Some ready to go each week. $15 + courier charge. South Island $27.00 courier. $14.00 Courier North Island(for 1 or 2). Order here or send us an email & we will send! Pay by Credit Card using PayPal. 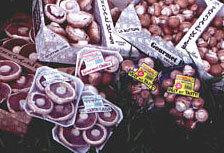 Parkvale Mushrooms Ltd is a family business owned and run by Clive Thompson. Clive has been growing mushrooms at Parkvale since the 6th September 1966 and has more recently established the "Gourmet Brown" mushroom in New Zealand. This "brown" mushroom has proven to have superior flavour and texture and grown at Parkvale is unsurpassed in the market. Whilst most vegetables and fruit; including normal mushrooms deteriorate more quickly once they reach full maturity, the Parkvale strain of "brown" mushroom can be grown to full maturity  the renowned Parkvale "FLAT"  and still keeps as well or better than other mushrooms.Although Parkvale mushrooms are generally eaten for their flavour, it is good to know that they are rich in vitamins, protein and fibre and low in calories. Theyre healthy! 7 Days 9a.m. to 12p.m. Parkvale Mushrooms grow in naturally fermented compost, rich in goodness, which has been composted for two weeks and then conditioned in a room at 45-60C. The compost generates its own heat during the composting and curing process. Mushroom spawn is then mixed through the compost. This colonizes fully over the next 13 days and into the 5cm of peat, which was added after spawning. The peat is now wet and mixed to ensure an even crop, and is transferred to the growing room, where it stays until the crop has been fully harvested. Generally at Parkvale, four flushes are picked over six weeks. Air is circulated around the mushroom crop and water is misted onto the mushrooms to ensure superb quality and flavour is achieved. The cap is tightly closed and the flesh is dense. These can be used in any traditional mushroom dish and are best for salads, kebabs, with chicken, rice or pasta, where a dense texture and less mushroom colour is preferred. The veil under the cap is stretched and breaking but the cap is still cup shaped. As the name suggests, they are ideal for stuffing and serving as an entree, or part of a main dish. This is the fully-grown "Gourmet Brown" mushroom. The cap has fully opened and the gills exposed. 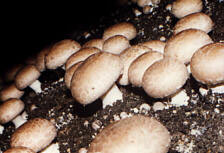 These have the "Full Country Flavour" that field mushrooms are renowned for, but a lower moisture content. They retain their texture through cooking and have been coined, "The Mushroom Pizza Base". Top with onion, peppers, tomatoes, cheese whatever! Theyre great! Cook in the oven, frypan or on the barbecue  you cant go wrong!